Not keen on the idea of wagering against live dogs competing in a race? That’s alright; there are now options for you to use a greyhound racing game instead. The world of the Internet makes it possible for an enormous number of wagers to be placed on a huge variety of races and sporting events each day. If, however, you would prefer to see dogs running only in the “virtual world” you can also safely place bets on electronic races too. Greyhound racing has always held a place close to the punter’s heart and there is nothing quite like the excitement of the gates flying open as a pack of hare hunting hounds run for your money. If you have been to a greyhound meeting before then you will know all about the exhilarating event, if you haven’t been before then there is no need to worry because now you can experience a day at the races from the comfort of your own home. The way these work is quite simple, and almost any greyhound racing game will allow you to play in the tutorial mode or even in the “real money” format as well. The games are operated by a heavily regulated type of software that is similar to most of the online casino games as well. This means that the outcome of any game cannot possibly be manipulated or controlled in any way. The thing about a greyhound racing game is that it will ask the player to create a user account through a hosted website, and will eventually require that the player create some sort of payment system too. This means that you will have to make a deposit in order to place wagers, but this usually is an extremely secure and protected arrangement that also makes it easy to receive your winnings immediately as well. Victor Chandler Virtual Greyhounds is a fixed-odds game based on greyhound racing which allows you to bet on an either a six-dog race or an eight-dog race and watch the race with high quality animations. Once you press 'Bet Now', you will be taken to the race viewer screen, and an animation of the race will be played meaning that you can experience all the thrills and spills of a dog race without having to stand in the freezing cold grandstand. If you do not want to watch the race at all, switch on 'Turbo Bet' before you press 'Bet Now' on the betting screen and you will find all the result as soon as you have placed the bet! 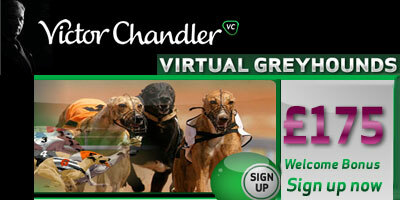 Sign up with VCgames through Skillandbet and play Virtual Greyhounds today. + £10 in Free Bets Every Week! Get a 100% matched free bet up to £30!